33 1/2 x 29 in. 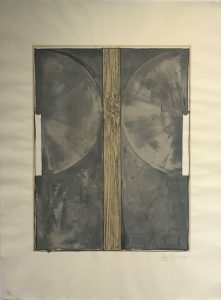 Jasper Johns is the world’s most critically acclaimed living artist. His work bridges the immediate post-World War II modernist trends of Surrealism and Abstract Expressionism with subsequent movements of Pop art, Minimalism, and Conceptual art. Johns was ushered into the New York art scene in 1953, when he met Robert Rauschenberg. The two artists shared an intense relationship, both romantic and artistic, from 1954 to 1961. They had neighboring studio spaces and deeply influenced each other’s artwork, exchanging ideas and techniques that would allow them to break from Abstract Expressionism. Their relationship would lead to Johns’ discovery by famed art dealer Leo Castelli, who, while visiting Rauschenberg’s studio met Johns and saw his work. Castelli offered the young Jasper Johns his first solo show on the spot. It was during his first exhibition that Alfred Barr, the founding director of the MoMA, purchased a number pieces that were on display, instantly making Jasper Johns a force in the art world. Johns’ breakthrough style was to appropriate popular iconography in his works with a rich treatment of the surface as lush and painterly. By representing common objects and images in the realm of fine art, Johns broke down the boundaries traditionally separating fine art and everyday life. However, rather than direct representation or abstraction, Johns made signs, like flags and targets, iconic images in his works. The “things the mind already knows” were his ideal subject because of the varied meanings each carried with it. This would lay the foundation for the Pop art movement’s aesthetic embrace of commodity culture, paving the path for Andy Warhol, James Rosenquist among many, many other post-war artists. While Johns continued to produce paintings that incorporated Abstract Expressionism’s gestures and color blocking, he shifted his focus from the finished image to the concept behind it. His process, which he believed to be the actual art, took on greater importance. The artist made a seamless transition into print making. For Johns, printmaking was a medium that encouraged experimentation through the ease with which it allowed for repeat endeavors. His innovations in screen printing, lithography, and etching revolutionized the field. As the Pop art movement grew around him, Johns left behind the colorful works filled with familiar gestures and images and turned to a darker palette. Some critics attribute the shift away from color and toward the grays, blacks, and whites that dominate many of his canvases from the early 1960s to the rocky end of his relationship with Rauschenberg. This week’s Work of the Week! WOW! is Jasper Johns’ Device. Created in 1971-72, Device masterfully plays with different tones of grey, white and beige. The works that use what Johns called “the device,” were made from two stretcher bars attached to a canvas frame with butterfly screws, creating a mechanical arm, that would be used to scrape the paint on the surface in a circular shape. All of these elements from the “real” world undercut the traditional idea of a painting as an illusion. The development of the device theme in Johns’ work progressed to incorporate other themes, such as the abundant use of text. His techniques stress conscious control rather than spontaneity. Over the past fifty years Johns has created a body of rich and complex work. His rigorous attention to the themes of popular imagery and abstraction has set the standards for American art. Constantly challenging the technical possibilities of printmaking, Johns laid the groundwork for a wide range of experimental artists that came after him. This entry was posted in WOW! and tagged americanart, art, artgallery, contemporaryart, device, fineart, gallery, greggshienbaum, greggshienbaumfineart, gsfineart, gsfineartmiami, jasperjohns, johns, miami, miamibeach, pop, popart, prints, workoftheweek, WOW, WOW!, wynwood, wynwoodmiami by admin. Bookmark the permalink.